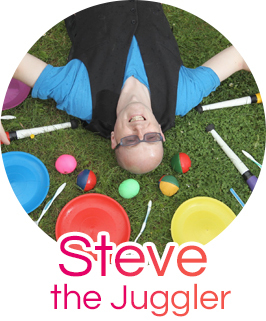 I get a lot of e-mails from people who are just starting out as jugglers and so I thought that they (and hopefully yourselves) may find this topic interesting and useful! STEP 1 – Choosing Music. Decide what prop(s) you are going to use in your routine, and then think of what genre you might want your song to come from. It may be that a classical or instrumental piece of music seems appropriate, or a heavy rock song. Once you have chosen your tune, then try listening to it 30-40 times. This allows you to make sure that you are not going to become sick of hearing the song! It also allows you to know every millisecond of that song off by heart. STEP 2 – Timeline. Look for obvious cues in the music. Draw a timeline of the song, where you split it into chunks. The chunks can be as simple as Verse 1 etc, or each line of the song lyric or by a period of time such as 10 second intervals. Build up the timeline so that it becomes more and more detailed. STEP 3 – Building your routine. Exaggerate any movements really big (to impress the audience). Find spaces in the routine that allow yourself some breathing space and return to simple tricks to build up your confidence and prepare for the next section of the song. Build in some applause points (at appropriate bits of the song). Harder tricks seem to go best with fast bits of music. Put some difficult tricks into your routine that you are yet to master, so you have an excuse to learn them! A section may be unchoreographed for a while if you need to find the best combination of tricks and experiment. Put your second best trick near the start of the routine and build up to the best trick near the very end (if the music allows for this). Lastly, you need to practice loads in front of audiences and adapt with their feedback. A word about Music Copyright. Please be very careful if you intend to use a song with the specific intention of making money from your routine, as you may breach copyright laws! For example, as far as I know, you cannot use music in an act which is then going to be sold as part of a video to make money. I have just put the finishing touches to my schools pack which is now available. If you would like me to send you a copy, then please get in touch and let me know your address to post it to. You can now view details of my new 30min schools show here. TOP TIP – Toothbrush Twirling! This is great fun to do at workshops, especially with children! All you need is one or more toothbrushes for each participant (you can normally pick up a pack in a 99p shop, so it is not expensive!) Balance a toothbrush so it is hanging down from your index finger. Now spin it in the direction so that it rotates under the finger. (if you try to spin the toothbrush in the other direction, it will just fly off into the distance!) After a few minutes, you should get the hang of this! The main idea is to keep a constant speed. I have been able to teach as young as 4yr olds how to toothbrush twirl, but for that age, I get them to use a devilstick silicon handstick instead of their finger as it is much, much easier! There are loads of tricks you can try once you have mastered the toothbrush twirl, so please get in touch if you want to know the next steps! More details on my Toothbrush Twirling Tricks page!